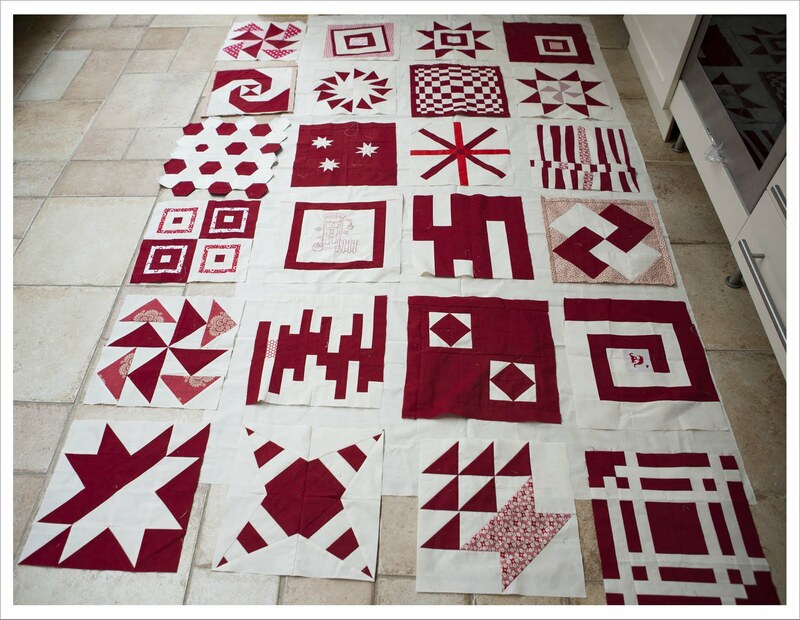 ... is what I will be calling my Sampler quilt that has been created by the Brit Bee Ladies. I have now received all blocks and also added my own. These two blocks are from the lovely Terri who gave them to me when we met at the Festival of Quilts last weeks. Terri forgot to take photos of them so I am doing it for her. Isn't this one utterly cute ? The next two bocks are my own. These were very much driven by scraps as I wanted to make good use of all the scraps and left over fabric the Ladies returned to me. Also I felt the quilt needed another good dollop of red. This first block is actually a collaboration between Terri and me, though unintentionally. 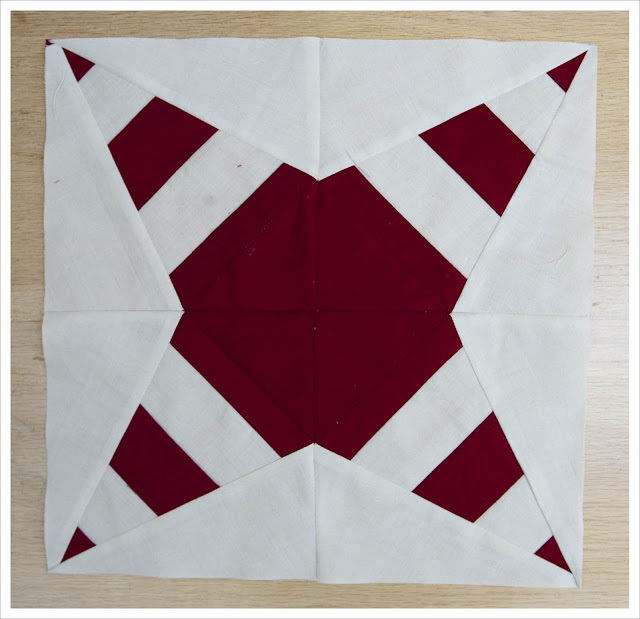 Terri returned eight HSTs and I thought I could make these into diamonds surround by more red. And this second block is actually my first paper pieced block !!! I used the 'Rocky Road to Kansas' block from the Summer Sampler Series. Isn't this gorgeous ! Then I did another layout test and wasn't happy at all as I find it way way to long. So I made another block. This time with some leftovers from Trudi and some scraps. And then changed the layout to square which I think works much much better. Now it's decision time. I need to decide which sashing to use (I think no sashing is not an option as the quilt will look to busy). 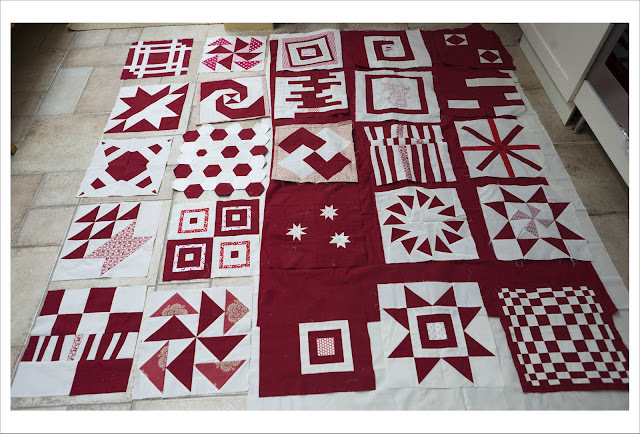 The above layout images show one in white sashing and the other in red. I really would appreciate your input and there is also the question of the back. Normally I am never lost for ideas but in this case I am somewhat. I kind of want to stick to the red/white scheme and was thinking to just do a four-patch of very large white and red squares with the siggy blocks scattered around. But maybe I am wearing red and white glasses at the moment. Any ideas ? And before I close I'd like to show you the two blocks I made for our lovely August Queen Bee who is Sarah from Narcoleptic in a cupboard. Sarah send us stunning fabric in all sorts of blues and some rather daring black plus chocolate, music and a super sweet pulverised drink. And after consuming all of that I was ready for some improve style blocks. She didn't want anything traditional so I went for the wonky and modern instead. 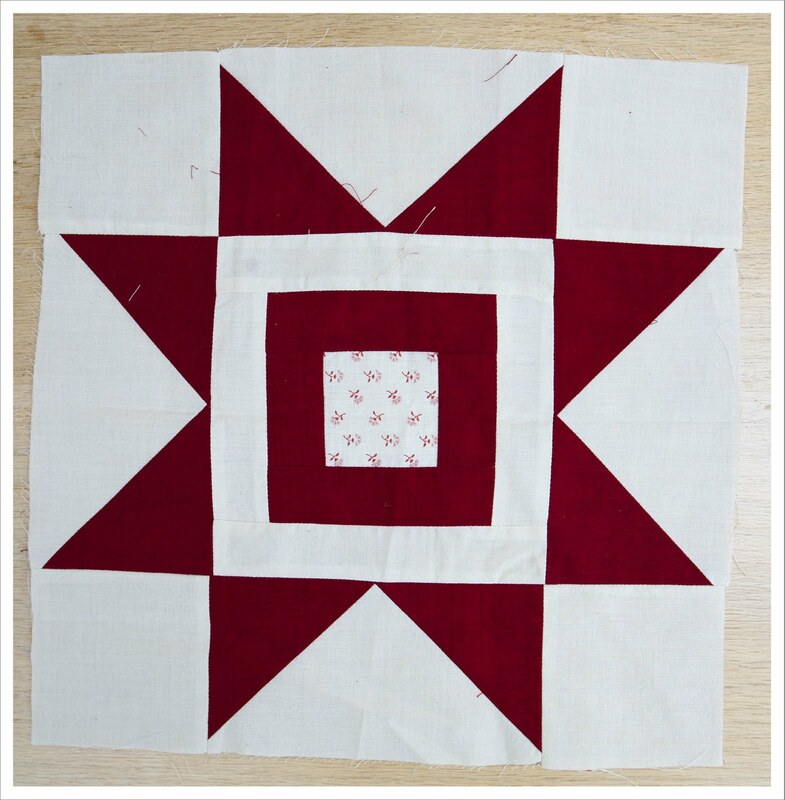 I think the red sashing makes for a bolder quilt, while the white softens it up a bit. Either will be a good choice, depending on the look you're going for. If it were me, I'd go with the softer white. :) Beautiful work so far! block with its 3 white stars gets lost on the red background. Although it may work better if that one block was perfectly centred and then balanced with white edged ones! It is a lovely quilt though!!!! Terri and you did such fabulous blocks. I love them and I love the quilt all laid out. I think you were right to do another block and go for the square quilt. If it was me, I would go for red sashing. To me it makes the blocks stand out more boldy and with these kind of blocks that is the look I would want. I would also stick to red and white for the backing. That is my humble opinion! 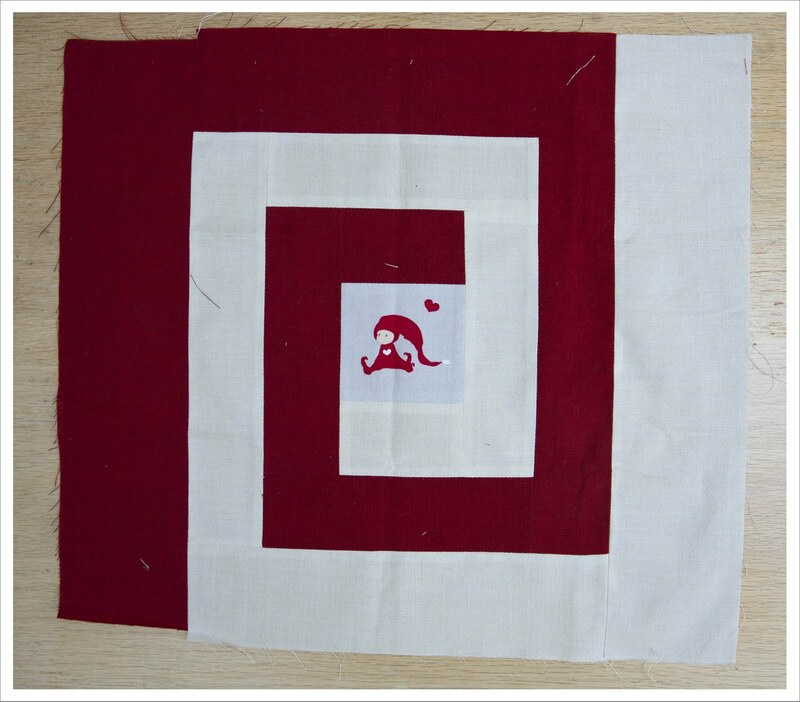 I would sash with white, but with red cornerstones. I think it'll help stop it looking busy (which I actually really like) but also the proportions that will be lost when you sash some of the blocks. For the back - how about a giant log cabin. 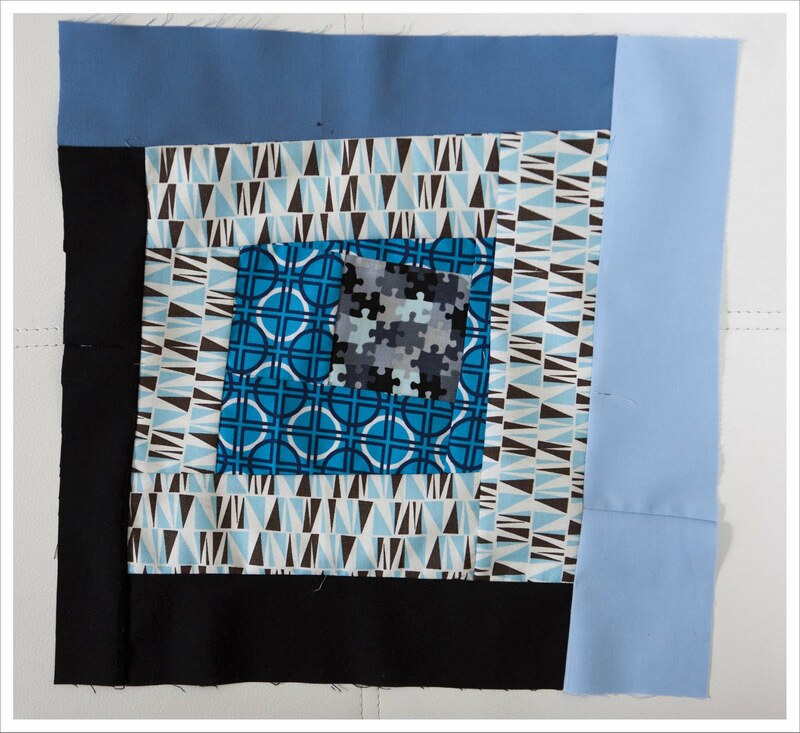 As the quilt is square it'd work beautifully. 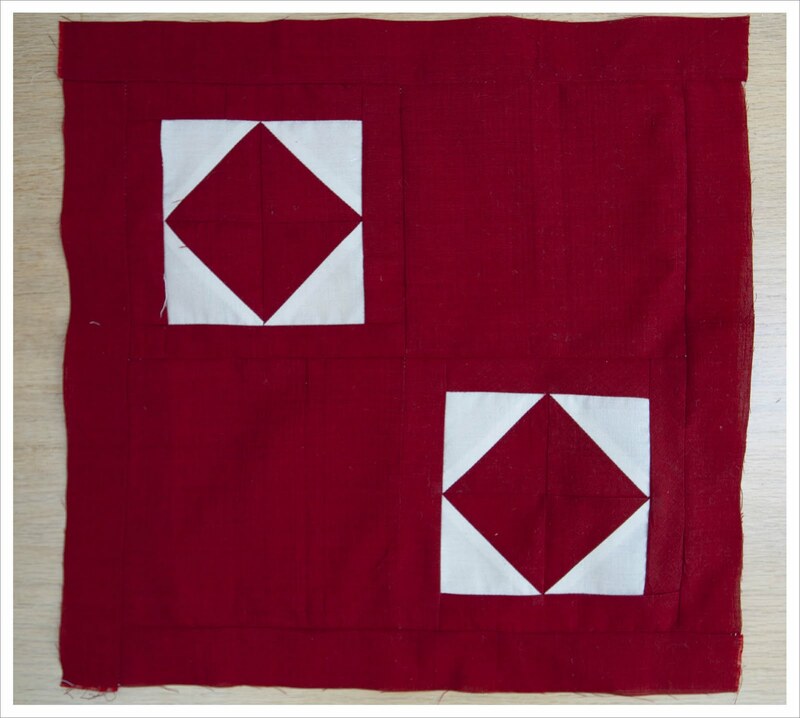 You could make up the heart of the log cabin with the siggy blocks - signifying the heart of the quilt. Whatever you choose, it'll be lovely - it's beautiful. I love the square layout and think that white sashing would look best. I love Katy's idea of cornerstones, and think her suggestion for a log cabin back sound great! and I forgot to say - I am with you on the paper piecing. I love the accuracy but can't cope with all the wastage! The quilt is just lovely - I would go for white sashing, and also love the idea of cornerstones as Katy suggested - and her idea of a huge log cabin on the back would be great - and give you a double sided quilt! Good luck! oooh, thanks Judith, my blocks are lovely! I'm going for the square layout too, its soooo long otherwise. 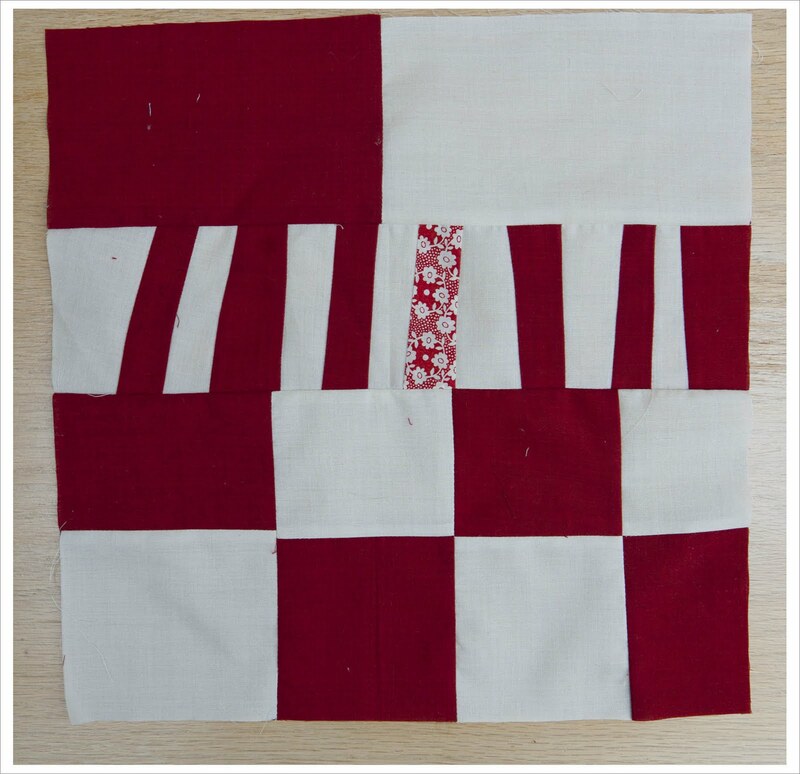 I'd go with the red sashing and white cornerstones, and I am sooo boring but I'd go with a solid red or white back! Its looking absolutely stunning though :-) Yours and Terri's blocks are great! Oh wow, it looks fab, well done us! I like the red sashing, but that's really based on a personal preference for the richer overall effect. If you want fresh, go with the white. I think I like the fact that the blocks will appear different sizes... Love the Bee blocks too, especially that first vortex one! RE sashing... Its a difficult choice. I like the red better for most of the blocks, but (and I'm being totally honest here), it doesn't look great on the really red blocks. They seem to just disappear and make a gaping red hole in the middle. So, looking at the white, that doesn't happen at all. 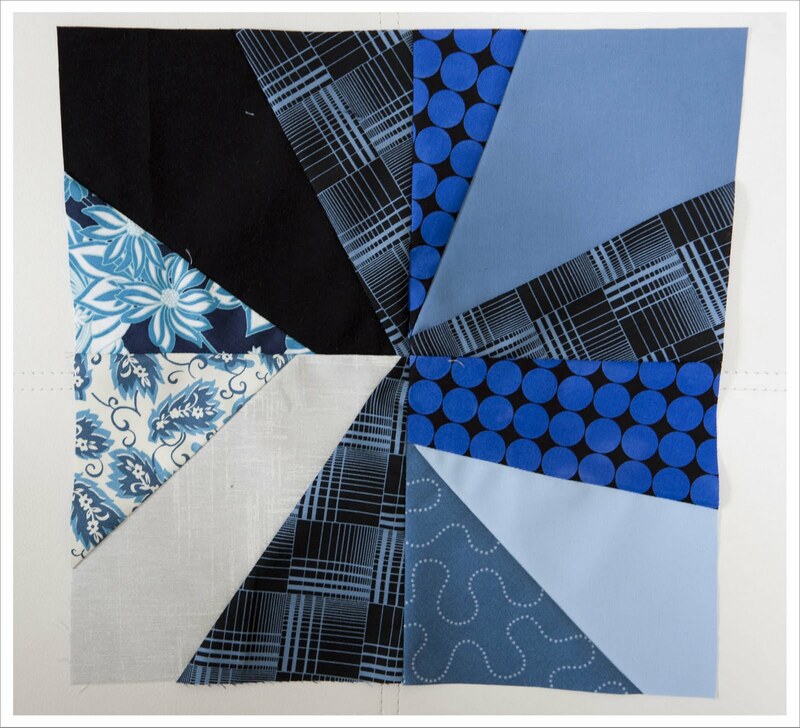 They all stand out well on their own and despite some of the edges getting lost, I think it works to the quilts advantage. You could do cornerstones as sarah suggests? If so, I would go with white sashing and red cornerstones. I LOVE love love the square layout Judith! And I love what you've done with all the scraps, in fact the one you made with mine jumped out at me as soon as I saw the layout! Fab! 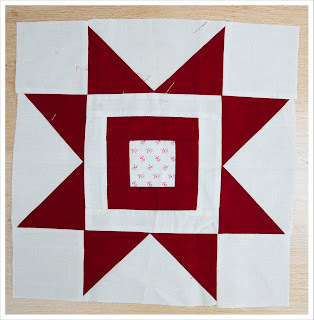 I was going to say red, but actually I think the idea of white with red cornerstones might be the solution - it means that no block will get totally lost in the sashing. Or even some sashed in red and some in white. I love it - so bright and zingy. How about a tiny red and white gingham check? I like the idea of the red but like many of the other ladies pointed out, your predominately red blocks get a bit lost in it. I think the best solution is the white with red cornerstones.